: preg_replace(): The /e modifier is deprecated, use preg_replace_callback instead in /home/rcousine/wiredcola.com/includes/unicode.inc on line 311. 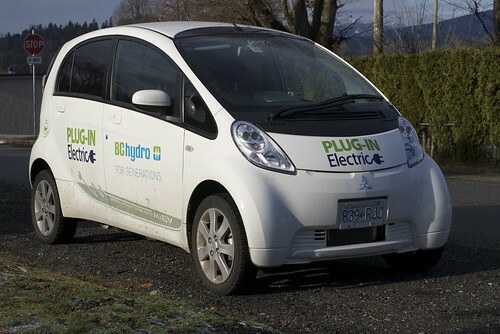 My friend Dave works at BC Hydro, and offered to take me for a ride in one of the odder company cars around: a Mitsubishi i MiEV. This isn't the first electric vehicle (EV) on the market, by a long shot, and technically the i MiEV isn't even on the market. But it's a little taste of a highly probable future. Dave's not allowed to lend the car to others, so I can't tell you what it's like to drive it. But I can tell you it's just a car. The important electric quirks, once sitting in the car, amount to a complete absence of noise at rest; very perky off-line acceleration; and range anxiety. Everything else is utterly normal.The oddest thing about this car isn't its EV nature, it's the fact it's right-hand drive. Bonus fun fact: Dave test-drove a new Scion tC, a reasonably sporty coupe. He described it as "not as much acceleration as the MiEV." This of a 180-hp car*. Range is about 160 km, and recharge is in several hours on a 220V circuit. This is totally typical of any of the upcoming lithium-based EVs: they all have the same basic charging rates, in terms of kWH into the battery pack per hour, and higher-voltage chargers mean faster charge rates. Blah blah blah. There are lots of reviews of these things around, they all say the same thing: goes nice, acts like a car, range anxiety is scary, price is too high. All true, so let's provide some insight. When do we get our electric cars? BC Hydro (and this car is part of the plan) is keen to assure you they're no dummies. And they aren't. The questions for them are "what happens when everyone owns an EV, and when does that happen?" The good news is the first answer is "not much." There are big problems for Hydro if everyone gets home at 5:30, and immediately powers up their car for a smart charge, especially if you're in a neighbourhood that goes EV all at once. That said, the grid-wide demand is not a problem, especially if they can push us all into staggered through-the-night charging using smart metering. There are a ton of fussy implementation details, including stuff like "install thousands of new meters," but none of the plans for living with EVs include "build another 2700 MW dam." In terms of power consumption, it's in the realm of a big space heater. Hydro is keen on managing power consumption because they have huge constraints on their ability to build more power generation infrastructure. Short version? 80% of our power comes from the Peace and Columbia river basin dams, completed in the 1970s, and we've been living off that glorious legacy ever since. And while I'm digressing, a very slick history of the Columbia hydro projects! (Full disclosure: I think big hydro dams are awesome, and not just because one of my dad's first jobs was part of the Peace River project). As for the second answer, "not yet." But that requires some explanation. The previous iterations of electric cars were all wildly compromised. The specs of something like the MiEV are slightly better than that of the RAV4 EV or EV1 from the late 1990s, but those vehicles were very expensive (much more than even their relatively high lease prices suggested). But The MiEV is still too expensive. Expected retail in the US is about $30,000 before tax breaks. The Nissan Leaf will probably eat its lunch at $32k, and the Volt will retail for $40k. I don't think any of the makers are losing money, either. But cars of the same size and quality are available for $10,000 less in each case (if not more), and the cost savings from going EV don't add up for most drivers (this is true for diesels and hybrids too, at least on this continent; some drivers can make them pay, though, as evidenced by the use of diesel on long-haul trucks and the proliferation of Prius taxis in Vancouver). What that means is that early adopters will buy some of them, but we're not at the LCD-versus-CRT-TV tipping point where the old technology (gas engine) is ready to go somewhere and die. The next step depends on the economies of scale, mostly. Lithium batteries are still expensive, and still the best EV power source. But the cost trajectory is promising. A decade seems like a sensible guess at when EVs will start displacing gas engines in the family-car market, but that's dependent on a ton of factors, not least of which is progress in making gas motors more efficient, and that progress has recently been shockingly high for such a mature technology. Meanwhile, I think self-driving cars are on nearly the same timeline as EVs, and there are some complementary aspects to the two technologies. And if I haven't made it clear, I'm a huge fan of self-driving cars. Brad Templeton's blog is a pretty good repository of news and background on that idea. *In theory, Dave is wrong. The tC could be clutch-dropped and is certainly faster to 60 than the Mitsu. 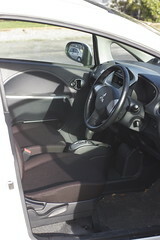 But in the hands of a real-world, non-abusive owner, the MiEV has readily accessible standing-start power. It feels way better. Wired Cola is a division of Globadom LLC. Regrettably, comments are closed. rcousine@gmail.com is open, as is the twitters. For better or for worse, more commentary happens on my Facebook page.